EagleVail’s Mikaela Shiffrin came from behind in a night World Cup slalom in Flachau, Austria, Tuesday to become the first woman ever to win the first five races of a calendar year. Her 10th victory of the season also tied Shiffrin with retired Austrian legend Annemarie Moser-Proell for the fastest to 41 career victories. For the first time this season, Mikaela Shiffrin came from behind to win a FIS Ski World Cup race – her fifth-straight victory – in Tuesday’s evening slalom in front of 7,000 fans in Flachau, Austria. She also tied Austria’s Annemarie Moser-Pröll with 41 World Cup victories before turning 23. Trailing Austria’s Bernadette Schild by 0.37-seconds after the first run, Shiffrin tackled the rough, choppy second run with a “nothing to lose” attitude and absolutely blew the doors off the competition. Schild settled for second, 0.94 seconds off Shiffrin’s winning time. Sweden’s Frida Hansdotter was third. Resi Stiegler (Jackson Hole, Wyo.) was the only other American to qualify for the second run and finished 26th. With her victory, Shiffrin added to her overall World Cup lead with 1,381 points. Switzerland’s Wendy Holdener is second with 560 points, and Slovenia’s Petra Vlhova is third with 554 points. 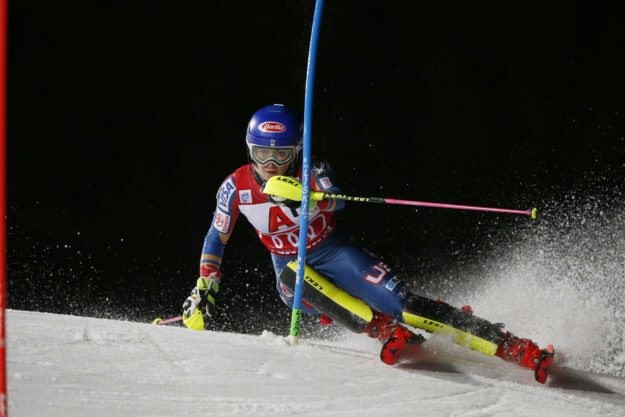 Shiffrin also leads the overall World Cup downhill, slalom, and giant slalom standings. However, will not participate in this weekend’s speed series in Bad Kleinkirchheim, Austria, opting to take a much-needed rest after competing in 10 races over the past three weeks – winning nine and finishing third in the other. Up next, the women’s World Cup Tour moves to Bad Kleinkirchheim for downhill and super-G races Jan. 13-14. Shiffrin is planning to return to the World Cup circuit Jan. 20-21 with downhill and Super-G races in Cortina, Italy.